Larry Ellison's Oracle Team USA is fighting to defend its America's Cup trophy after being dinged for making illegal modifications to the team's 2012 yacht. Larry Ellison made $96 million last year as CEO of Oracle. 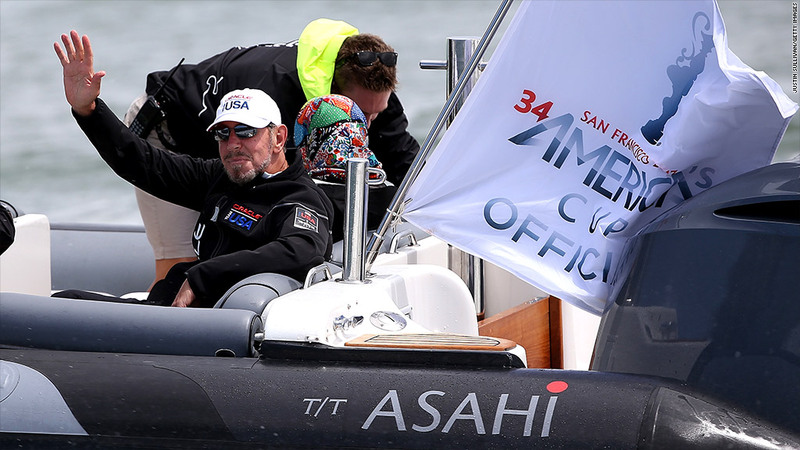 So a $250,000 fine levied this week against his Oracle Team USA yacht racing team won't make a dent. But the penalty that went with it could hurt his chances of keeping the America's Cup trophy. Ellison's Oracle Team USA, which will be racing to defend its America's Cup trophy starting Saturday, was dinged by an international jury for making modifications to its 2012 yacht that violated America's Cup rules. Subsequently, three team members have been excluded from this year's race, and the team has been fined $250,000. In August, Oracle Team USA also voluntarily (and retroactively) withdrew from the 2012 regattas in question. The team was also hit with a two-point deduction in the upcoming finals, which start on Saturday. That means the team will need to win 11 races to keep the trophy. Challenger Emirates Team New Zealand has to win only 9 races. On the plus side for Ellison's team: None of its senior members were involved in the misconduct. "The rules infractions involved only a few of our 130 team members, and were done without the knowledge of either our team's management or the skippers who were driving the boats," Russell Coutts, Oracle Team USA CEO, said in a statement. "While we disagree with the unprecedented penalties imposed by the Jury, we have no choice but to make the necessary changes" and do our best to get ready for the race. The infraction could cast a pall over Ellison's reputation in the sailing community. Competition, and challenges, tend to run high as rivals try to gain any edge they can through design changes within the America's Cup rules. Founded in 1851, the America's Cup is the oldest and most prestigious yachting race in the world. Ellison's Oracle Team USA scored a big victory in 2010, when they brought the trophy back to America. Only four nations have won the Cup: The United States, Australia, New Zealand and Switzerland. Oracle (ORCL) was unavailable for immediate comment.